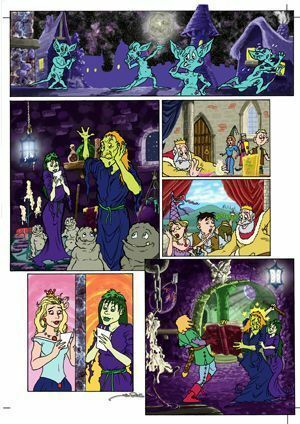 When John Ridgway approached Tim in 2005 to produce a comic strip along the lines of his fantasy - faerie tale settings, but with a humorous twist to it, Tim responded straight away and came up with Myth Adventures. The premise behind the storylines is one of the dialogue telling an entirely different account then the pictures. So whilst the captions may describe a gallant knight rescuing a damsel in distress the illustration will show something to the contrary. "When John approached me I was over the moon. We have known each other a long while now and have worked on many projects together in the past. For John to approach me with no parameters except to come up with one of my fantasy - faerie tale storylines, adding a humorous angle I took it as an enormous compliment." "I decided to do something a little different with the 'Myth Adventures' project whereby I drew the story in pencil and then painted the backgrounds digitally in Photoshop in an illustrative style, but left the characters with flat colouring, again done in Photoshop to create an animated cell type look to the artwork." The strip is still linked with John's "Eureka Project" and is awaiting publication at some point in the near future.